My husband was inspired to make this after watching Paul Deal make a dessert quesadilla on Food Network. I unfortunately missed out on dessert as I was at work when he made them. I was told that it was good and that everyone else devoured them. I hope he makes them again and hopefully I will be home to enjoy them. Topping favorites-caramel sauce,chocolate sauce, ice cream, ect. Peel, Cut and dice pears, cook in water and sugar until soft. Drain and cool. Add bananas, pears, and brown sugar to sauce pan and caramelize sugar over medium heat. You know, for some reason I had never thought of a quesadilla as something to make as a desert! This does look good however! I am hopping through on Saturday evening! If you haven't yet, Please Follow back Parga's Junkyard Blogand on facebook as well as on my new networking site Like it Ladder Thanks! ohhhhhhhhh i want to eat these right now! This does look good. It looks like the perfect dessert to make when a craving hits and you don't have a lot of time to bake something. Thanks for sharing on Sweet Indulgences Sunday. Looks really interesting! Saw this on Savory Sunday! Thanks for sharing! Love this twist on the good ol quesadilla! Yum Yum! I hope that he makes those again sometime when you are home. They look delicious. 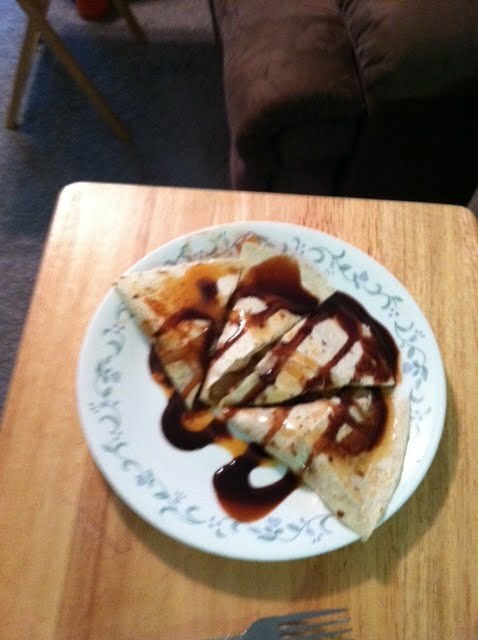 I have never thought of making a dessert quesadilla. I am going to have to try that. Yum! Just popped in from Too Cute Tuesday. I love your blog. This sounds delicious! Thanks so much for sharing. Looks gorgeous! Skimping dinner tonight - straight to dessert! Interesting (and yummy!). Wish I'd found this before my pears and bananas went bad! I hope you have a spectacular day with great and superb dishes. This looks so yummy and best of all looks simple to make. I am newest follower in your blog and enjoyed lot in my first visit. What a great dessert. This is fabulous Pear and Banana Quesadilla. Thank you so much for sharing with Full Plate Thursday and hope you have a great week end. Hi! I like your Blog! Yummy! I'm following your blog!!! I hope your visit! Have great day!